The content of this article provides interesting history, facts and information about famous Roman sword called the Gladius. Definition: Gladius is a Latin word for sword. This sword was originally known as the Gladius Hispaniensis, or "Hispanic Sword.". The Romans took the best ideas and different types of weapons from the nations that they conquered, making improvements and adjustments as required. Thus the Hispanic Sword (Gladius Hispanus) became the famous Roman sword adopted after the second Punic War (c200 BC). The origins of the design of the gladius were Celtic. The word gladius acquired a general meaning as any type of sword. Towards the end of the second century A.D. the spatha took the place of the famous sword in the Roman legions. Definition: The original sword, taken from the Hispanic design, was the 27 inch short straight sword, which broadened towards the handle giving it a slight "wasp-waist" or "leaf-blade" curvature. This type of sword had a two-edged blade and a tapered point. 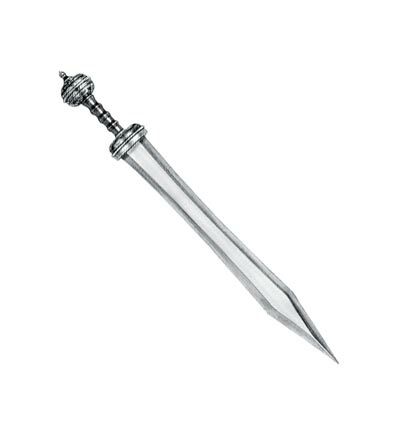 The Gladius was the weapon after which the gladiator (swordsman) was named. The Roman sword had a solid, comfortable hilt (capulus) sometimes designed with ridges for the fingers. The sword hilts of infantry officers were occasionally ornately decorated. The blade of the gladius used by the Roman infantry was occasionally decorated with a crest. The owner's name, especially if they were high ranking soldiers, was often engraved or punched on the blade. This was a type of sword used by the Roman army and by some gladiators in the Roman arenas including the Colosseum. The gladiators who used the sword were those who were armed with body-shields such as the secutor, myrmillo, hoplomachus and the dimacheris. The short design of the sword was particularly effective for thrusting and stabbing movements and could penetrate the armor of opponents via its tapered point. Its two-edged blade was designed for cutting and slashing. The purpose of the Roman Gladius was therefore multi-functional. The sword was sheathed in a scabbard. The scabbard, which held the blade of the sword, was either mounted on a belt or on a shoulder strap. Roman scabbards were made of wood which were covered with leather and decorated with a frame made of either brass or of iron. The content of this Gladius category on the weapons used by soldiers and gladiators in Ancient Rome provides free educational details, facts and information for reference and research for schools, colleges and homework. Refer to the Colosseum Sitemap for a comprehensive search on interesting different categories containing the history, facts and information about Ancient Rome. Just like the subject of gladius there is hardly a page of Roman history and the Roman weapons that is not, on some way, connected to the Roman Colosseum which became a symbol of Rome, its society, culture and life.